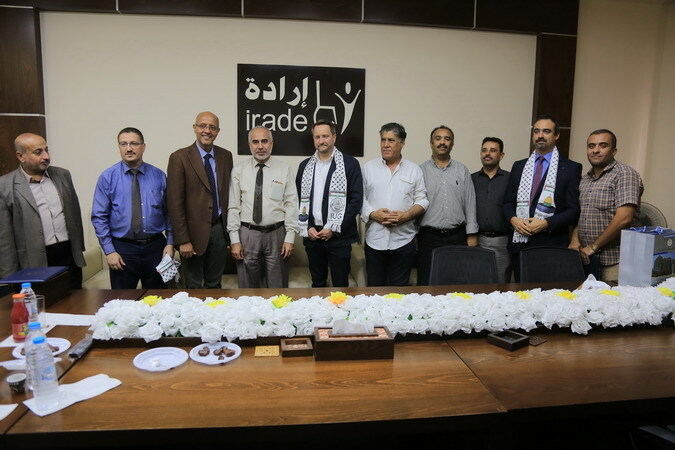 BTI of Islamic University has recently signed a cooperative agreement with United Nations Development Programme UNDP to implement a brand new project (Gazans Online)- GoLance, which aims at rising up the alumni's necessary freelancing skills in the Gaza strip. The project works on training (150) alumni from all majors on how to work properly on the International and Arab freelancing platforms and the tools and strategies they can use to have jobs in the field of translation and Information technology. The agreement was signed by the IUG president Prof. Nasser Farahat, and the Special Representative of the UNDP/PAPP Programme MR. Roberto Valent, in the presence of the Deputy Special Representative for UNDP/PAPP Programme Mr. Geoff Priwitt, the UNDP Gaza advisor Mr. Francisco Roquette, and the UNDP Coordinator Eng. Juma Najjar. And from the Islamic University, the Dean of External Relations Prof. Ahmed Mohaisen, the Dean of Community Service and Continuing Education Dr. Saeed Al-Ghorra, and the BTI Director Eng. Basel Qandil. Prof. Farahat expressed his pleasure on the project's signature, which is a culmination of success and continuous cooperation between the Islamic University and the UNDP. "The role of this project appears in rising up the technical and entrepreneurial skills of graduates in which they will be provided with necessary-to-freelancers logistical and guidance services in the training workshops", the president said. Eng. Juma al-Najjar stressed the project's importance in refining the skills and knowledge of graduates to match up with the needs of the business markets, and to provide employment opportunities for young people outside the borders of the Gaza Strip. "This fruitful cooperation with UNDP aims at accelerating the development process in all-serving-society fields, he reported. The for- signing- agreement visit shed lights on the notable accomplishments of the former BTI-UNDP cooperation, praising the success stories achieved in the SEED 1, 2 projects; in which (31) entrepreneur projects were financially supported and incubated by the Programme of Assistance to the Palestinian People (PAPP) funded by UNDP.